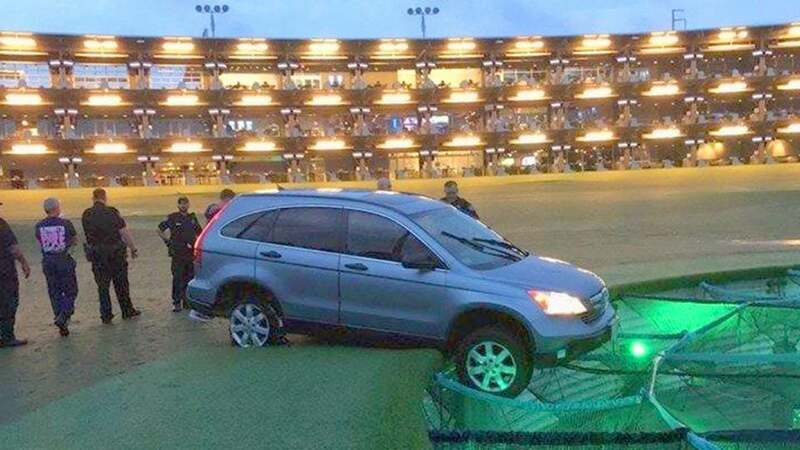 A unnamed suspect drove this stolen car onto a Topgolf driving range in Georgia on Thursday. On a trip to Topgolf, you expect the normal rules and traditions of golf to fall by the wayside. That's pretty much the point. But driving a stolen car on the range? That's abnormal even for the quirky (and wildly popular) Topgolf. According to WSB-TV, an employee at TopGolf's facility in Alpharetta, Ga., was working the morning shift on Thursday when they noticed a car ripping around the driving range at 7:00 a.m. The employee alerted the police who arrived on the scene shortly thereafter. The unnamed driver of the vehicle made the responding officers' job easy by getting the small SUV stuck in one of the driving ranges targets. The Alpharetta Department of Public Safety posted a photo of the car teetering on the edge of the target to Facebook. https://www.facebook.com/AlpharettaDPS/posts/2216864178353092 WSB-TV talked to Officer Howard Miller, one of the arresting officers, who provided some details. "The vehicle went onto the turn and continued on and almost went into one of the target holes Thankfully, one of the wires on the netting between the target got underneath the vehicle and saved the car from taking a 6-foot drop." The report states that the car was stolen from nearby Cobb County, and that the suspect gained access to the range through an entrance used by the maintenance crew.